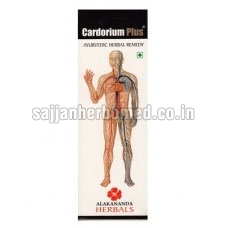 We are offering Cardorium Plus Syrup that is an effective herbal remedy for improving the blood circulation. It enhances the blood flow by disintegrating the blocks and strengthening the blood vessels of the heart and other blood vessels. Our Cardorium Plus Syrup is hygienically formulated by the experts using premium grade natural ingredients. It normalizes lipid ratios, improves fat metabolism / excretion, antioxidant and free radical scavenging, prevents platelet agglutination, improves the strength of blood vessels etc. Our Cardorium Plus Syrup is made available at very reasonable prices. Precautions : Cardorium plus keeps blood in fluid stage. Thereby aspnn blood thinners need not be used, careful with anticoagulants better stop cardorium plus 2 days before any surgery including dental extraction all ingredients of cardorium plus are having anti-hyperglycemic affect. There by diabetic drug dosage to be regulated as per the blood glucose levels. Indications : Hypertension coronary heart disease , heart failure. cerebro - vascular insufficiency (carotid artery blockage).Macular degeneration of the eye. Obesity, prevent complications and manage blood sugar levels, diabetic-gangrene. Diabetic - retinopathy. Diabetic nephropachy. Diabetic - neuropathy, reynaud's disease. Erectile dysfunction. Peripheral arterial blockages. Deep vein thrombosis. Pulmonary hypertension, anti ageing arthritis. Dementia and parkinson's disease. Dosage : 10ml to 20ml twice a day for a period of 90 days or as suggested by the physician.